A layer of soft ganache on the bottom and a strawberry, cream cheese filling on top. Hello there! I’m so glad you’ve stopped by. Each month I participate in a challenge with several other bloggers. We each have to come up with a new recipe, using that month’s challenge ingredient. This month, the ingredient was chocolate. I was pretty happy about that ingredient. I love chocolate! I have been wanting to make a black bottom pie for a while now, so I thought this was a good time. So there is a regular pie crust in this pie, but next time I make this, I am going to try an Oreo crust. I think Nilla Wafers, Golden Oreos, or graham crackers would make a great crust as well. On top of the crust is a layer of soft ganache. I folded some whipped cream into my ganache, so that it would stay soft, like the strawberry layer. The strawberry layer is made with cream cheese, whipped cream, mini marshmallows, and of course strawberries. With all those white ingredients, the red color of the strawberries gets really muted and looks pink. You could always add some red food coloring if you want a darker red/ pink color to you filling. I garnished the edges of the pie with some chocolate covered strawberries, and then drizzled some hot fudge sauce over each slice. 1 pie crust- pastry crust, graham cracker crust, Oreo crust, etc. Prepare pie crust, by either baking the pastry crust in a pie pan, or making a crumb crust with Oreos, graham crackers, etc. Set crust aside. In a small pot, over medium-high heat, warm the heavy cream until small bubbles start to form around the edges, not boiling. Pour the hot cream over the chocolate chips in a glass bowl, and let sit for about 3-5 minutes. Using a whisk, mix the softened chocolate chips and the cream until they are evenly combined, and smooth. Let cool to room temperature- a few minutes in the fridge will make that go faster. Fold the 1/2 cup cool whip into the melted chocolate with a rubber scraper. Scrape this ganache into your pie crust, spread it evenly over the bottom, then let it chill in the fridge. Chop, or mash your strawberries to make 1 1/2 cups. I like to use my food processor for this- don't puree them, just let them go until they are in very small pieces. In a large mixing bowl, beat the cream cheese and powdered sugar until smooth. Beat in the strawberries until combined. Fold in the cool whip and then the mini marshmallows. Pour this filling into your pie crust, smooth the top and return it to the fridge until it is firm. Place your chocolate covered strawberries evenly around the edge of the pie. Slice and serve your pieces of pie, and drizzle some hot fudge sauce over each slice. Store leftovers in the fridge, covered with plastic wrap. 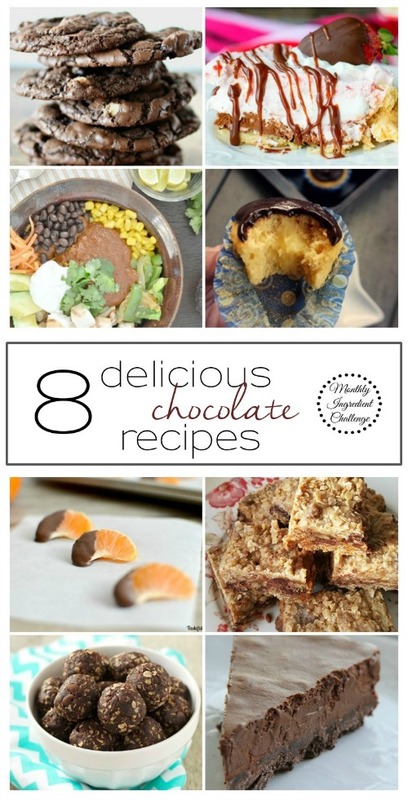 And check out these other great recipes using chocolate from some more friendly bloggers doing the Monthly Ingredient Challenge. This looks amazing! All of the pie crust suggestions sound good to me, but I think I’m going to try it with the vanilla wafers. Pinning! Thanks, Roxanne! I’d love to hear how it turns out with the vanilla wafers! Let me know! Totally will be doing this with an Oreo crust 🙂 It’s beautiful Leia!! Thanks, Emily! I think it will be delicious with the Oreos. I bet raspberries would be really good! I love raspberries. Enjoy! Oh my goodness Leia this pie looks and sounds AH-MAZING!! I definitely want to give this a try ASAP!